When disaster strikes, the wildlife clinic at the Phillip Island Nature Park will be ready, equipped to deploy hundreds of tiny wool sweaters at a moment's notice. 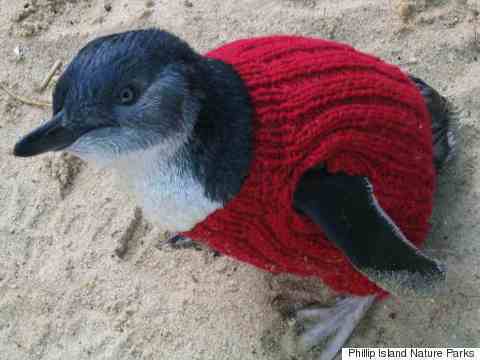 Not tiny sweaters for people, but penguins -- knit by a group of volunteers that includes Alfred "Alfie" Date, who at 109 years of age is Australia's oldest man. Date smiles with a tiny wool sweater he knit for a penguin. 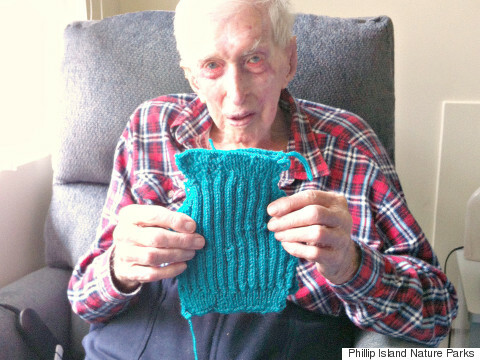 Date told Australia's Ninemsn he started knitting the "easy single-rib and double-rib" sweaters shortly after moving to a retirement home in southwest Australia. After learning he could knit, two nurses who knew of the "Knits for Nature" program approached him to gauge his interest, Date said, adding, "I'm a sucker. I can't say no." In the event of an oil spill near Phillip Island's 32,000 little penguins, wildlife clinic workers put oil-covered birds in sweaters to minimize the amount of oil they ingest while preening themselves. According to the Philip Island Penguin Foundation, the substance also matts the penguin's feathers, which both prevents it from regulating its temperature and reduces the animal's buoyancy in water. Following a spill near Phillip Island in 2001, 483 little penguins ended up at the rehabilitation center, with 96 percent ultimately being released back into the wild. 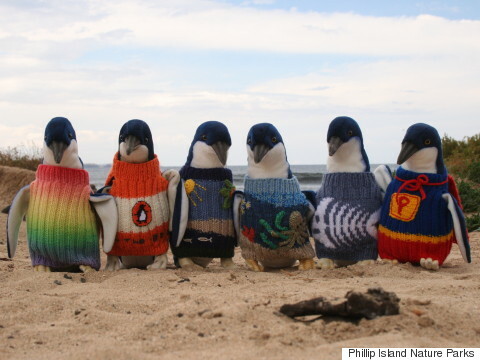 At this time, the center does not need any more penguin sweaters. This story has been updated with photos from Phillip Island Nature Parks.